Fr. Lapide writes: “Emmaus was a village in the time of Christ, according to S. Jerome the birthplace of Cleopas; who seems now to have gone thither for some family reason.” It would seem that, after the crucifixion of our Lord, Cleopas decided to return home – on the way to his home in Emmaus, he and his companion met the risen Lord. It has become popular in some intellectual circles to speculate that the companion was the wife of Cleopas; there is, however, little textual evidence to support such a claim. Certainly, it is grammatically possible that the companion was a woman, but this theory seems to stem more from modern feminism than from historical evidence. There is a tradition of identifying Cleopas of Emmaus as the brother of St. Joseph. This connection is drawn from the reference to Mary, the wife of Cleopas who stood at the foot of the Cross (cf. John 19:25). This Mary is identified with Mary the mother of James the lesser, of Joseph and of Salome (cf. Mark 15:40; Matthew 27:56). Moreover, James the lesser is stated to be the son of Alpheaus, which may be the Aramaic version of Cleopas (cf. Matthew 10:3; Mark 3:18). Then he would also be the father of St. Jude Thaddeaus, who is the brother of James (cf. Jude 1:1). Now, both Jude and James are among the brothers of the Lord, which likely indicates that they were the cousins of Jesus. This would provide some scriptural foundation for the identification of Cleopas as a relative of St. Joseph. However, for this pious belief, we rely far more on the oral tradition of the Church Fathers, than on explicit passages of Scripture. Further, if Cleopas is the same who was the husband of Mary the mother of James the lesser, it may then be inferred that he was the grandfather of the sons of Zebedee – since Mary, the mother of James, seems to be also the mother of Salome (Mark 16:1, Mary, the mother of James and Salome) who is herself the mother of James and John (since Salome is not mentioned by name in Matthew 27:56, but is instead intended as the mother of the sons of Zebedee). The Cleopas of Emmaus mentioned in Luke 24 is written Kleopas, while that mentioned as in John 19 is written Klopas. Hence, there is a difficulty. Nevertheless, this difficulty does not seem to be insurmountable. First, we note that Cleopas could likely be the Greek version of an Aramaic name (Alpheaus), hence it would be no surprise if the two Evangelists spelled it slightly differently – much as Elijah and Elias are one and the same, though different English spellings are used in the transliterations. As a second and connected point, we mention the fact that these are accounts derived from two Evangelists and not one – and it is not uncommon for numerous minor spelling varioutions to exist among the Sacred Authors (hence, in the book of Revelation, Jerusalem is spelled differently than in the Gospels). 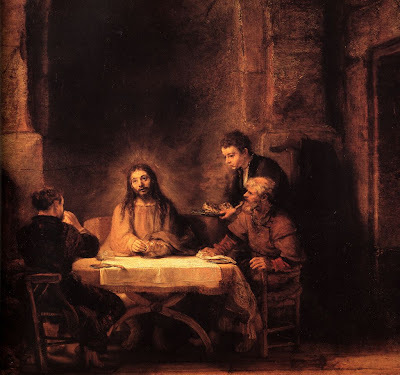 Therefore, there does not seem to be any reason prima facie to rule out the tradition of venerating St. Cleopas of Emmaus as the brother of St. Joseph. St. Cleopas, Pray for us! Would it not be more productive to focus upon what we know from Scripture than to focus upon imaginative speculations? I am at a low to understand how such exercises help the Faith. It is true that, in Catechesis, we must first focus on the fundamentals of the faith -- on those doctrines clearly proposed to the faithful through Scripture and Tradition. Still, any who love the Lord will be like Jeremiah -- devouring his words! Thus, every little detail will become an opportunity for spiritual enrichment. I recommend that you look to some of the commentaries of the Church Fathers (St. Augustine and St. John Chrysostom especially) -- you will notice how they rejoice in the intricate interpretation of passages (just like this one about Cleopas). In any case, if you wish to know "how such exercises help the Fiath" ... I would recommend that you re-read the last line of my article: "St. Cleopas, Pray for us!" ... hopefully, the study of this verse will incline us to greater spiritual friendship and devotion. Thank you for the post. That was great. I never heard of that tradition in the Fathers. It is really amazing to see the connections that exist in the Gospel text instead of seeing these people as completely random. The fact that Jesus after the Resurrection would visit his uncle and his disciples father and grandfather, makes a lot of sense. It is also good to keep in mind that the Fathers of the Church lived in a privileged period, and the stories and people were still fresh in the minds of the Christian community. I would like to encourage "A Seminarian" to look to the Fathers as the way to interpret Scripture. I know that during my studies in the seminary I had to waste time on the Historical Critical Method, which I find does me very little good in preparing homilies and understanding Scripture. Oh Father, this is wonderful!!! I told St. Cleophus about this last night and I think he was happy that he will be more widely known now. Until this post, I had the exclusive "ear" of the Cleophas Family as I have prayed to them for years. Here is a thought that came to me the other night regarding who was at the foot of the Cross. It would make sense then why St. John was there. Aside from the fact that he was an apostle and Our Lord would have been his second cousin, his mother and grandmother as well as his "Great Aunt" Mary were there as well. In any event, thank you for making St. Cleophas more well known. Now I will have to share him with others (and gladly do so!). Thanks so much for this post! I had read some of this in a 5th grade homeschool art textbook. And yes, Seminarian, it DOES enhance my faith to think about how the people in the scriptures were related. How many times I wondered, How did these people just believe Jesus? Weren't they a bit more discerning? Finding out that so many of those that we read about were related means that they really KNEW Jesus. They had watched Him grow up or had grown up with Him. These people had a great deal of discernment. They had the chance to observe, question, evaluate and decide based on evidence, not on a "good feeling" that so many give as their reason for believing in God. It is simply REASONABLE that so many of His followers were from His FAMILY. Our Faith IS reasonable. Many many thanks for this rich information which enriched my knowledge. May the Almighty God bless all those who work sincerely to disclose the hidden jewels of the Holy Scripture.Please pray for me.